Now is probably the perfect time to think about plants that provide structure and interest in our gardens during the dark and chilly days of winter. With the cold wintry nights we have actually had some wonderful sunny days over the last few weeks, so there has been plenty of opportunity to walk around the garden and to admire some of the grasses and perennials that are not just still standing but are contributing shape and even colour in the form of a myriad shades of brown and beige. 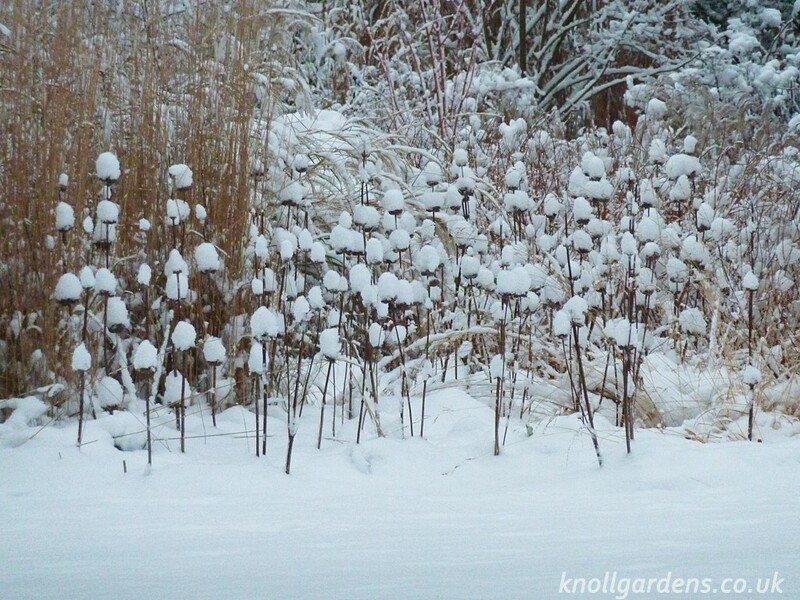 The garden at Knoll is open, weather permitting, from tuesday to saturday 10am to 4pm where you can see just how effective these plants are at creating real winter interest. By spring these plants will need their annual maintenence, and you can either watch a short video on how to do this or join us on a short morning class in March to see for yourself how this is done. 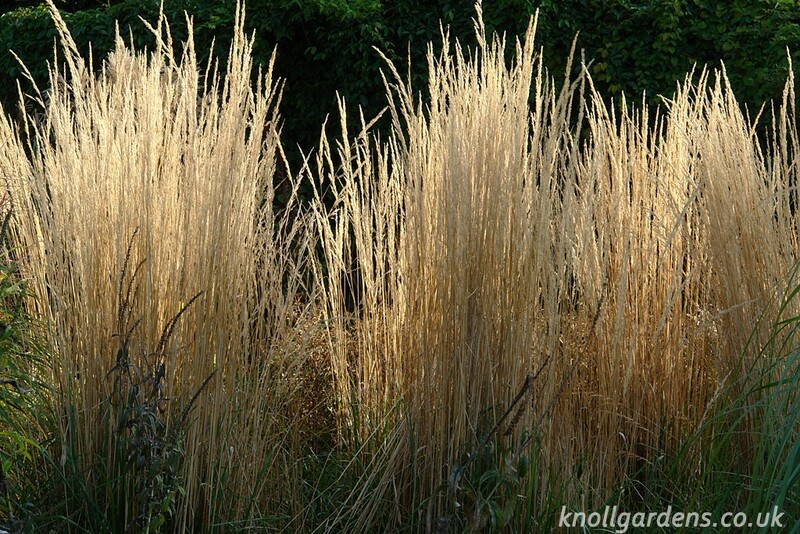 Take for example the most wonderful and versatile Calamagrostis Karl Foerster (above), with its upright sheaves of individually tiny flower stems that are produced in such numbers as to create a magical vertical accent wherever it is used. Like all grasses it changes with the seasons, starting before mid summer with its purple flowers that gradually fade to its trademark beige. Superb in a border with other plants and also hugely effective when used as an informal hedge or screen. Rudbeckia laciniata (above),is a tall perennial with attractive foliage and masses of yellow flowers held on the tips of the stems but is scarcely less valuable during the winter months, especially when seen against the winter sunshine. 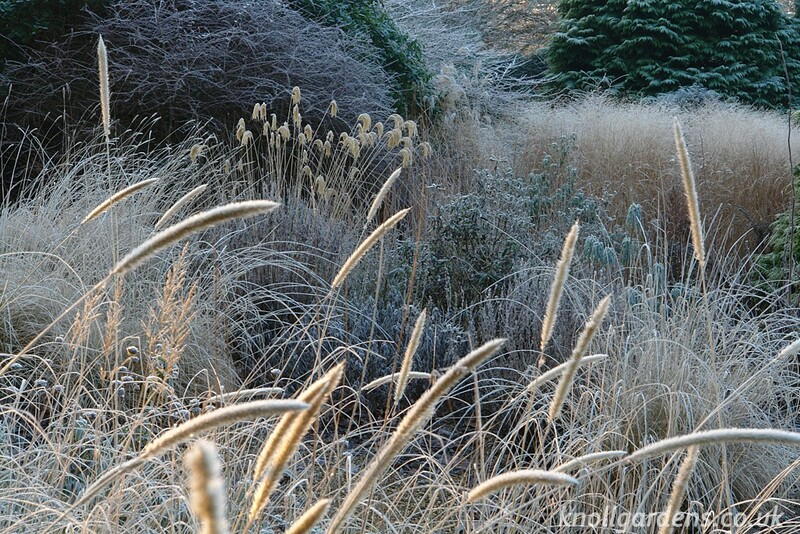 The dark brown of its dried winter foliage, stems and flowers makes an effective contrast to lighter coloured grasses such as panicum and miscanthus. Another perennial that has great winter presence is Veronicastrum virginicum which I use in our Decennium border primarily for its strong habit and amazing upright finger like flowers in many shades of mauve to purple, pink and white. It is yet another first class perennial that needs no staking, deadheading or spraying and is invaluable for these reasons alone. However its winter garb can be just as valuable with its warm rusty brown dried flower stems that persist for most of the winter. It makes a wonderful contrast to many grasses, and I have it doing just that (see below), in the garden partnered with Panicum Heavy Metal that is itself equally valuable in its summer or winter outfit. Miscanthus are a great group of grasses that contribute solid mounds of foliage and masses of flowers from high summer onwards. They are often used as accent plants in mixed borders; a purpose at which they excel when used amongst other perennials. 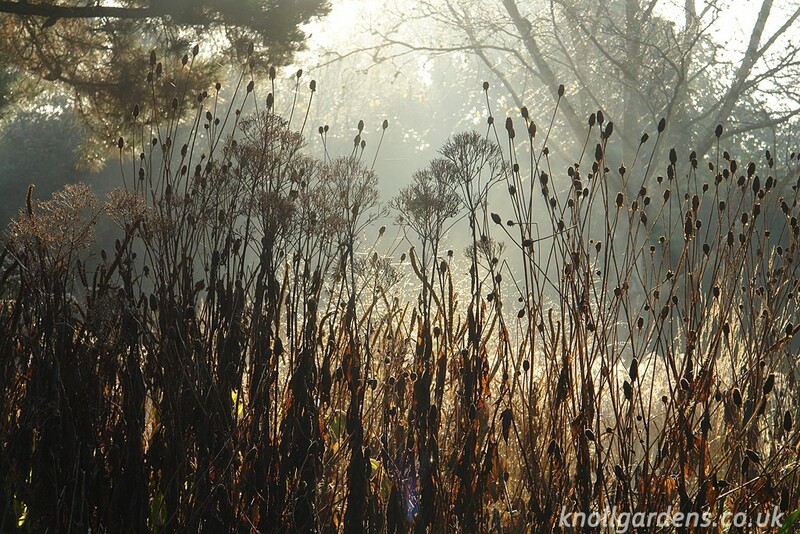 But, as you can see from the image below, they are also pretty effective when used along with other grasses such as pennisetums, and a limited range of perennials such as eupatorium and verbena in a more naturalistic style planting at Knoll. 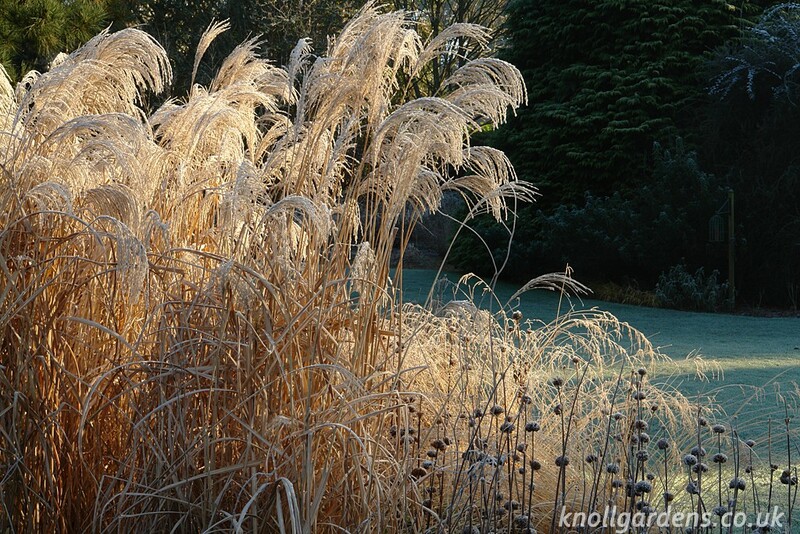 Another miscanthus with a distinctive outline is Miscanthus nepalensis which, as you can see from the image below of the Gravel Garden holds its gently pendulous golden thread like flowers (centre left), on dainty looking stems well clear of the basal foliage. 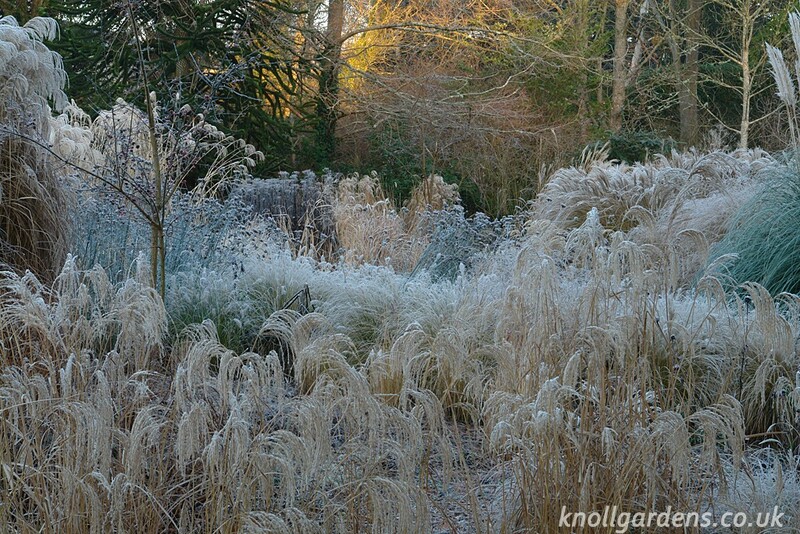 It is not the most hardy of miscanthus and needs careful siting with sunshine and good drainage to do well. But it is well worth any such trouble for its simply fabulous flowers!! Also in the foreground of this picture are the long cylindrical heads of Pennisetum macrourum, with Muhlenbergia rigens in the centre and the relatively tall massed cloud like flowers of prairie switch grass, Panicum virgatum, top right. 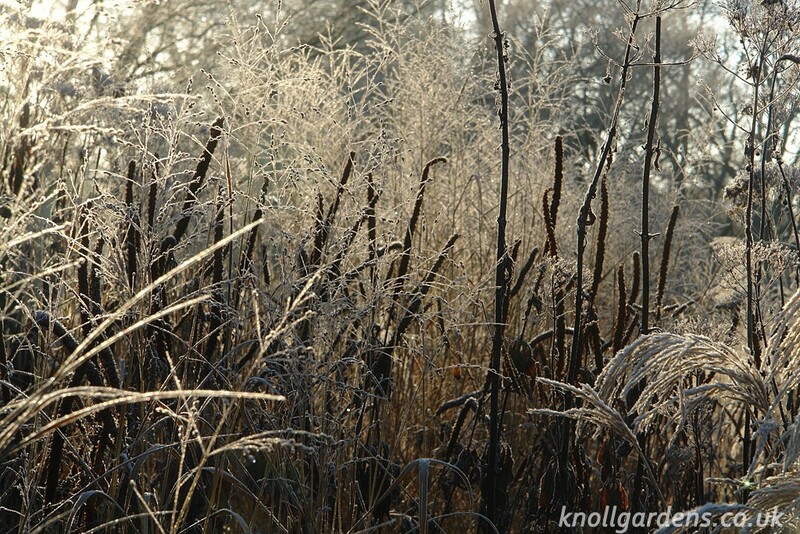 It may be winter but there is no lack of shape and form and texture with these plants. Miscanthus Flamingo is one of the my very favourite miscanthus, partly for its pendulous pink flowers but equally for the amazing texture of the flowers once the initial colour has drained away. The picture above shows it in effective combination with the distinctive whorled flowerheads of Phlomis russeliana; yet another plant as effective in the winter as in the summer and one with which I would not ever want to be without. I have used it mostly in the Decennium border, in very dry conditions, and whenever we get any snow it wears little hats of white that never fail to make me smile. 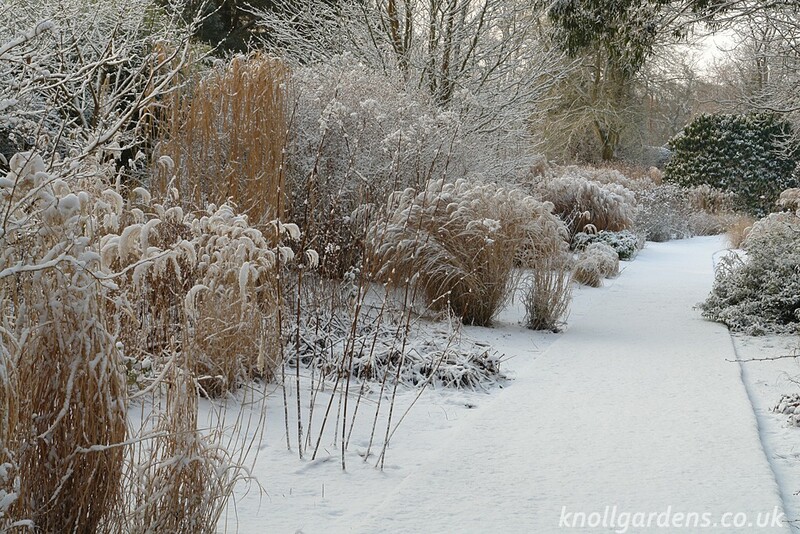 We are not too keen on snow overall, but when it does fall the garden takes on a special quality with the snow seeming to highlight the amazing structural shapes of the grasses and perennials and turning the garden into a magical winter wonderland that never fails to delight!